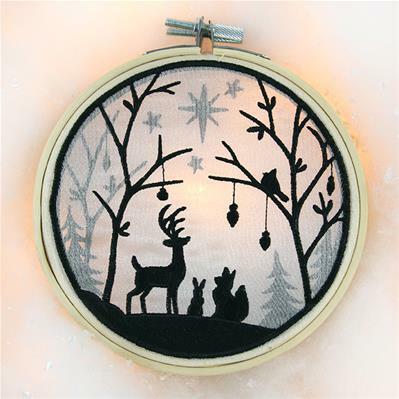 Craft an ethereal winter scene with unique multi-layered embroidery! 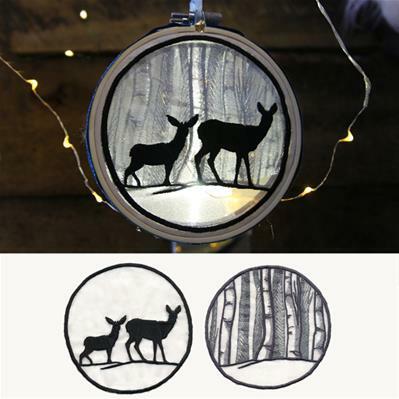 Stitch each design separately onto translucent organza, then hoop in a hand embroidery hoop and stack together. 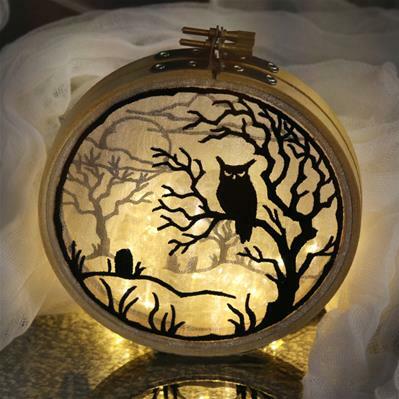 Available in a range of sizes, these decorations are sure to dazzle! 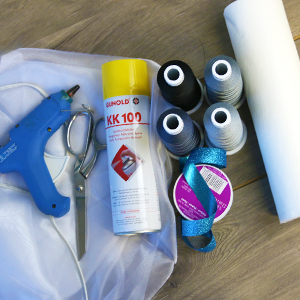 To get started, cut a piece of organza fabric larger than your hoop. Spray a piece of heavy duty water-soluble stabilizer with temporary spray adhesive, and smooth it on the back of the organza. 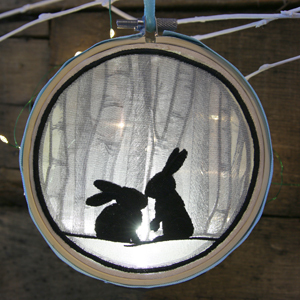 Hoop the fabric and organza taut together. 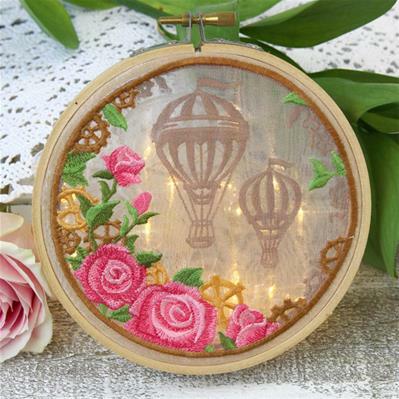 Since the embroidery will be seen from both sides, you'll also want to wind a bobbin to match each color thread that you'll be using for the design. 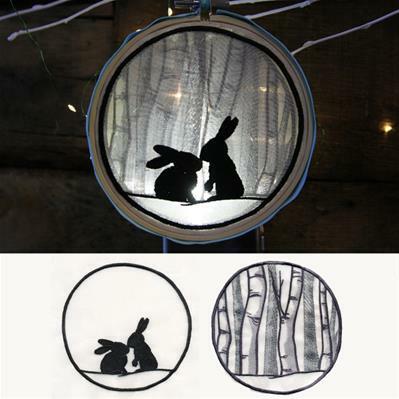 Each organza shadowbox design consists of two files. 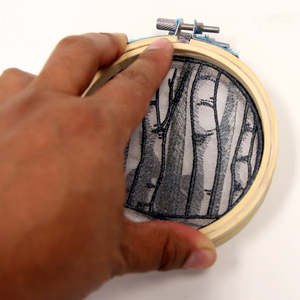 Load file "a" into the machine, and start stitching. 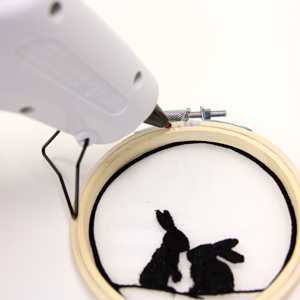 Make sure to match the bobbin thread to the top thread. 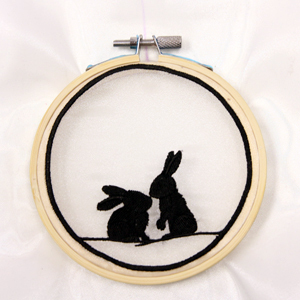 Once the design is complete, repeat these instructions to hoop up another piece of organza with heavy water soluble stabilizer, and stitch file "b". 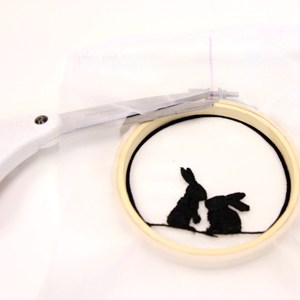 Once both designs have sewn out, remove the organza from the hoop. 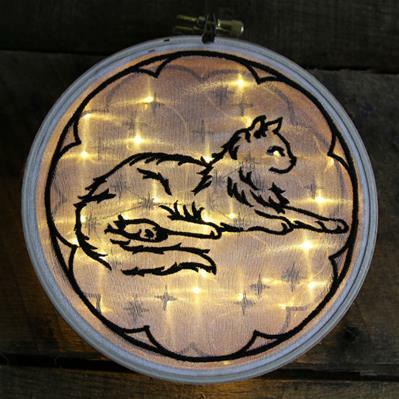 Cut away the excess stabilizer and trim any loose or long threads on the backside of the embroidery. Soak away the remaining stabilizer according to the package instructions. Let the organza air dry, then press with an iron set on a low heat setting, using a pressing cloth between the iron and the embroidery. 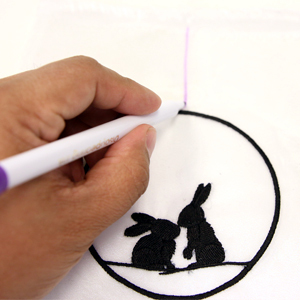 To add the organza panel to the hand embroidery hoop, start by laying the panel face up, and mark the center of the design with an air erase or water soluble marker. 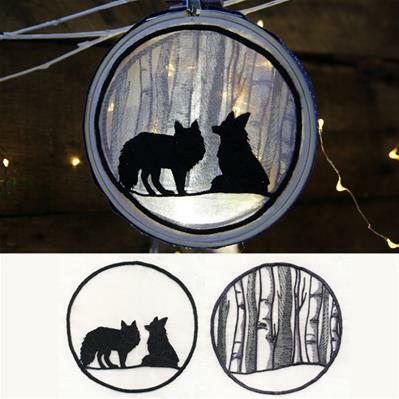 Lay design piece "a" face up over the inner hoop of the hand embroidery hoop. 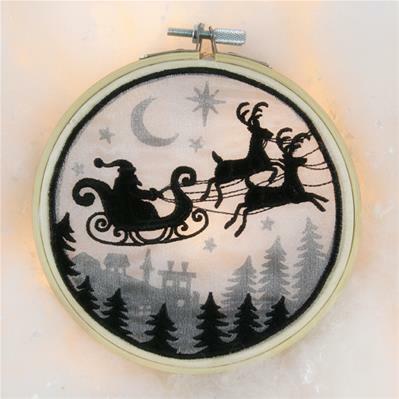 Place the outer hoop over the fabric, so that the mark lines up with the center of the hoop screw. Press firmly so that the fabric lays smooth and taut. Tighten the hoop screw. Do not trim the edges yet. Repeat this step for design "b". 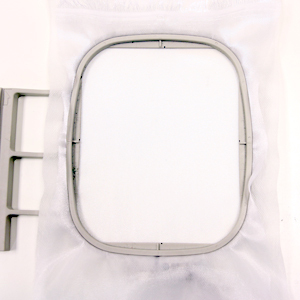 Lay the embroidery hoops, raw edge of the fabric up, and trim the excess fabric. Try to get as close to the hoop's edge as possible. 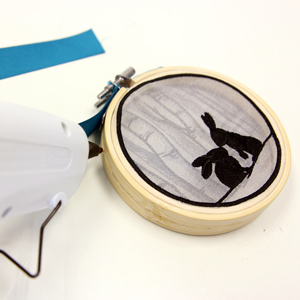 On the back of the hoop containing design "a", run a line of hot glue along the edge of the hoop. 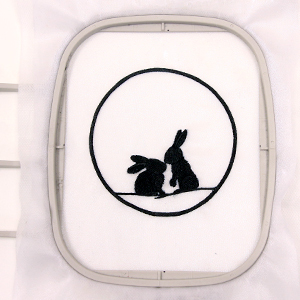 Attach the front of the embroidery hoop, containing design "b" to the back of the design "a" hoop, and press firmly for ten seconds. 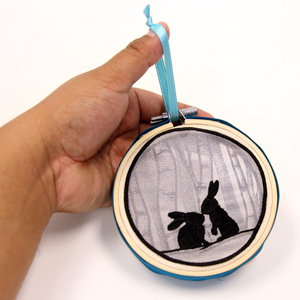 Cut a piece of ribbon long enough to wrap around the circumference of the stacked embroidery hoops. 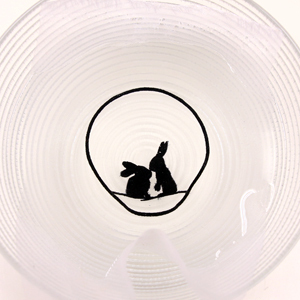 Attach the ribbon to the outside of the hoops with hot glue. 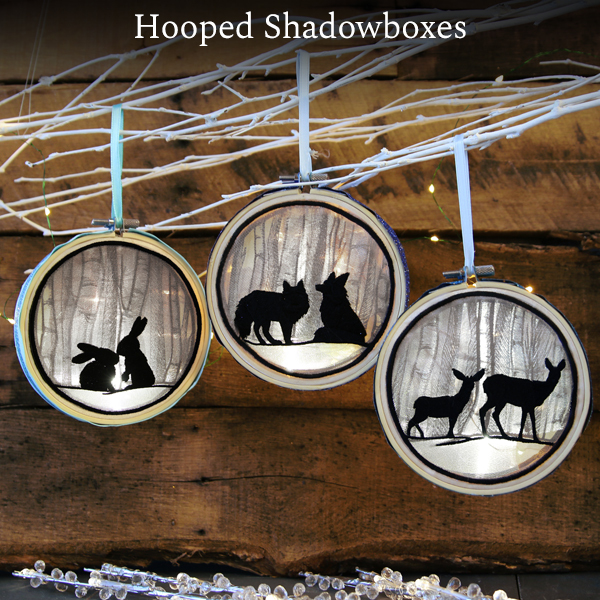 Add a loop of ribbon or string through the hoop screw to hang your shadowbox. 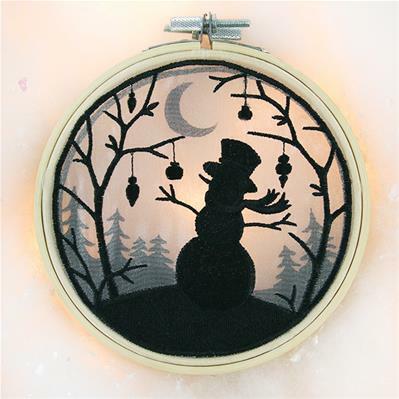 Display your wintry shadowbox in front of a window or other light source to create a magical effect!